Previously unavailable to most South Africans, the Truth Commission Special Report organisations, civil society organisations working in the field of transitional justice (both in South Africa and abroad), as well as those working with trauma support groups in affected communities. This project has received financial support from the Charles Stewart Mott Foundation and Atlantic Philanthropies. 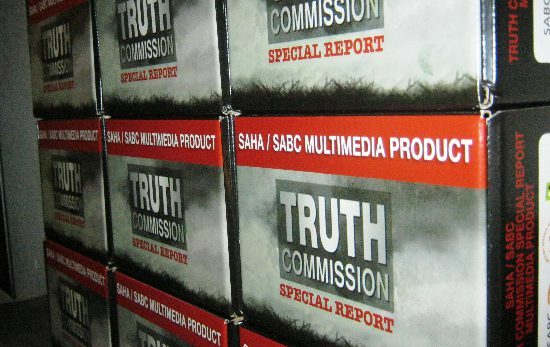 Broadcast nationally between 1996 and 1998, the weekly Truth Commission Special Report series reported on the testimonies being heard at public TRC hearings across South Africa during that time. These audio-visual records form a critical resource that provides a powerful window into the conflicts of the past and ongoing challenges for reconciliation. The Truth Commission Special Reportseries includes 87 episodes. SAHA has secured access to 86 of these episodes, and has expended a considerable amount of energy sourcing ‘missing' episodes from the National Archives and, most recently, Yale University. One episode, however, appears to be unavailable from these sources and the SABC. These 86 episodes have been catalogued, transcribed, indexed and hyperlinked to a copy for the official TRC website, the official TRC Final Report and other resources to form a seamless interactive product, viewable and searchable on portable multimedia players. • Instructions on how to use the multimedia player. To mark fifteen years since the TRC came into operation, this unique resource was launched in December 2010. Copies were distributed to South African university libraries and non-profit organisations working in the transitional justice field in early 2011. In 2011 - 2012, SAHA, in conjunction with the SABC, adapted this product to develop a website, to be launched in 2013.